Travelling in the car safely, is a subject we feel strongly about. In a crash an unrestrained pet could be seriously injured. 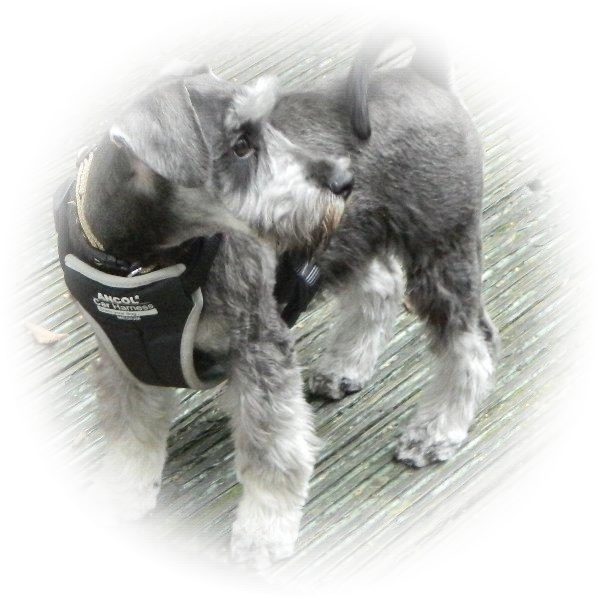 At 30mph, for example an avarage size Miniature Schnauzer would be thrown forward with a force equivalent to almost four twelve stone adults. Unrestrained pets can also distract a driver and cause an accident. Even pets that are normally well behaved could get frightened by something unusual and jump on a drivers lap. Following a crash an unrestrained pet could escape and be hit by another vehicle or cause another collision. A frightened dog may also attack strangers who are trying to help. Our favoured restraint is the dog seatbelt safety harness, though a suitable secured pet carrier, travel cage or crate, or dog gaurd will do the job.